If you have a Facebook Page that drives traffic to your website or a client’s website, you could probably benefit from adding Google Analytics to your FBML tabs. This data, combined with the information provided through Facebook Insights, can help you create a more well-rounded idea of where your visitors are coming from and what they’re doing. Here is a quick three-step process for adding Google Analytics to your Facebook Page. Assuming you already have a Google Analytics account, the first step is to add a new profile for the Facebook tab you want to track. If you don’t have a Google Analytics account yet, you’ll need to create one to get started. Since each FBML tab on your Facebook Page has it’s own unique URL, you can add separate Analytics code to each custom tab. We’ll do just one FBML tab in this tutorial. 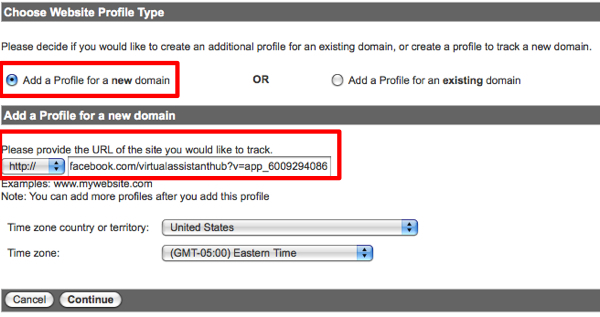 Go to your Google Analytics account and click the “Add new profile” link. The next screen will give you the tracking details; we are most interested in the Web Property ID, which looks something like: UA-9999999-9. Keep that line handy. Copy the code below, and replace the UA-9999999-9 with your Web Property ID code as shown above. Then, paste the line at the bottom on your FBML code and save your changes. Once you’ve completed the two previous steps, go back Google Analytics, click “Finish,” and you will see your tab URL listing with a “Tracking Not Installed” icon: . It can take up to 24 hours for the tracking to kick in. You’ll want to come back to this page in a day or so to confirm it is tracking correctly. If you plan to add Google Analytics to more than one tab, you will want to rename the tab in Analytics to make it easier for you to keep track. Click the pencil icon to the right of the field and enter a new nickname for the page. And that’s it. The statistics generated and activity tracked will depend on what type of content you have on your FBML tab, but you will be able to see daily pageviews at a minimum. Do you track your Facebook Page visitors using Google Analytics, Facebook Insights or something else?